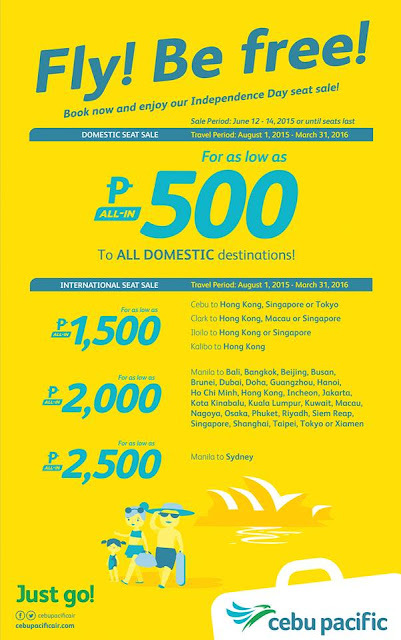 Cebu Pacific Promo Fare: #CEBSeatSale: Fly! Be free! Book now and enjoy our Independence Day seat sale! So take advantage of this promo, Pinoys! Let's celebrate our Freedom! Quoted fares are valid for one-way travel only. Inclusive of 7 kg hand carry baggage allowance, base fare, web admin fee and all taxes collected at point-of-sale. Terminal fees for non-Manila stations and Php 1,620 International Travel Tax must be paid at the airport. Promo fares have limited availability and are nonrefundable but rebookable subject to the following rebooking fees: Php 1,200 (domestic), Php 2,000 (short haul) and Php 2, 500 (long haul) plus fare difference. For your convenience, flight changes, availing of prepaid baggage allowance for check-in baggage and self check-in services can be done up to four hours before your scheduled flight. All Manila, Cebu to Boracay, Davao and v.v. including all international flights (except China and long haul) may only be availed online cebupacificair.com. August 1, 2015 zamboanga-manila. August 12, 2015 manila-zamboanga. Next time kung magpost kayo ng promotion..ilagay nyo ang link kung saan tama or malapit lapit ang fare na mkukuha namin, hindi itong maloloka ka sa kakahanap kung paano makukuha ang promo nyo! Bakit ba ayaw nyo tanggapain ang bayad sa DEBIT CARD? Eh aming na ngang pera ito. Mas gusto pa ninyo yong inutang thru CREDIT CARDS? Bakit hindi ninyo ino 'honor' yong bayad thru bank sa ibang bansa like Australia? Ni hindi nyo nga gi tsek muna. Payag naman ang bank namin ah! 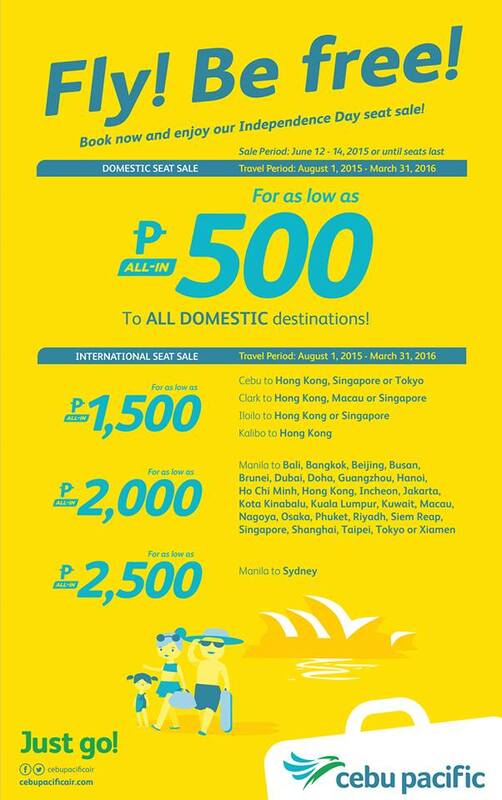 Cebu Pacific Promo for VISA Cardholders! International Picnic Day 2015 Promo! Promo Fares for June 2015!